Map One My first attempt to code the data in R. White arcs denote locations people referred to as "favorite" places and red arcs denote places people said they wanted to visit. Map Two In this map I gave each student their own hexadecimal color and thinned the lines hoping to show things more clearly and to show better where lines overlapped, etc. Map Three This map shows the paths from South Bend, IN to all the state capitals. I used a different hexadecimal color code for each capital and watched this awesome fire-work type shape emerged. My final project was focused on data visualization. There hasn't been any other subject all semester that has impacted me as much. 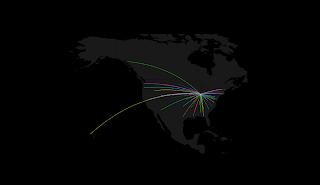 My goal was to create maps that showed travel paths in still shots with data collected from my class mates. I requested students e-mail me with a "favorite"place outside of IN and a place they would like to go to outside IN. 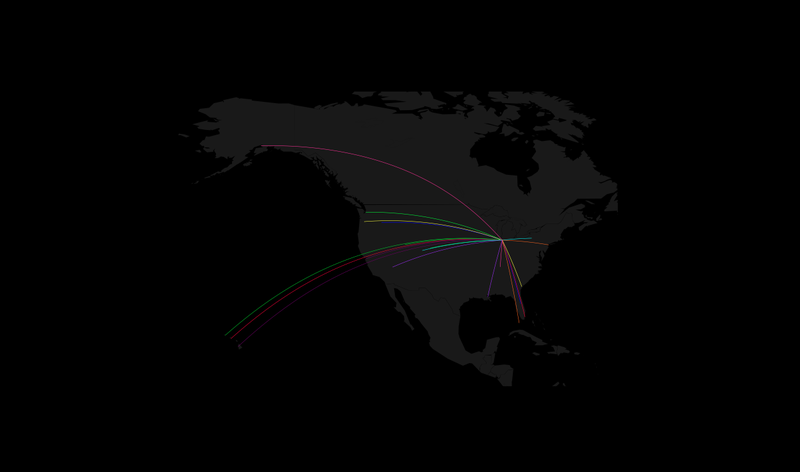 Taking that data and using the open source software and coding language R I created visual representations of the data I collected. I was asked how this was humanizing the data and I think my project does that in a couple of ways. Firstly, it shows data in a way that is purely aesthetic and I believe people are more likely to take the time to stare at this than to look at the excel documents that created it. 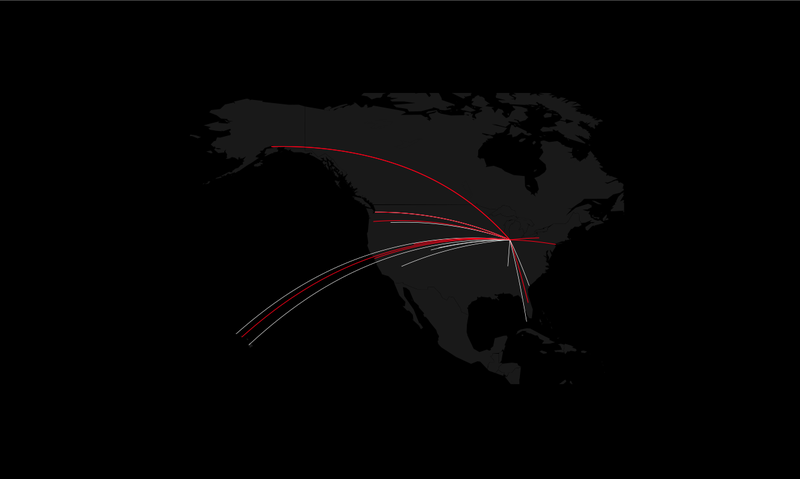 Data feels cold but these visualizations provide something that feels warmer. Secondly, and perhaps this is most interesting to me as a Sociology major, these visualizations (map 1 & 2) show the patterns that developed in the data. So many people chose favorite places and places they hope to go that are west or located in places warm and sunny. To see these paths, all leading out of South Bend, IN, provides a map that is all about the human desire to be elsewhere and the desire to migrate to climates that are warmer, brighter, etc. My third map shows the paths from South Bend to all the state capitals. Perhaps it's not, somehow, overly humanizing, but it gives a new way to look at this information. A different way to contextualize something we know but perhaps don't really have a visual image for in our minds. Steele, Julie, and Noah Iliinsky. Beautiful Visualization: Looking at Data Through the Eyes of Experts. Sebastopol, CA: O'Reilly Media Inc., 2010. Wegman, Edward J., and Jürgen Symanzik. "Immersive Projection Technology for Visual Data Mining. "Journal of Computational and Graphical Statistics. 11. no. 1 (2002): 163-188. Thorp, Jer. "Jer Thorp speaking at TDC10." Vimeo (2010): Accessed April 19th, 2012. http://vimeo.com/12792211.